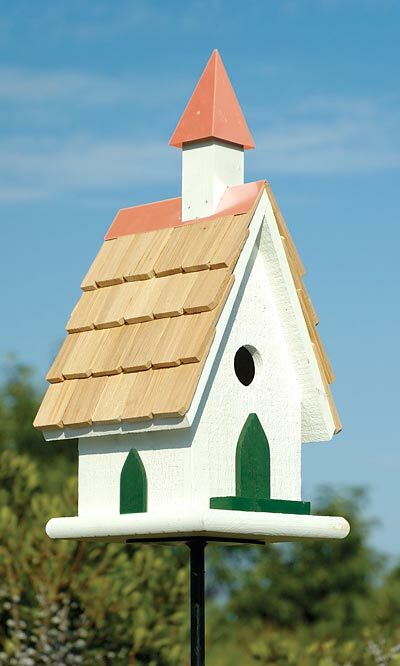 Invite neighborhood birds to congregate in your garden by adding the Heartwood White Country Wildwood Church to it. This brilliant shelter adds not only style, but also a wonderful theme to your backyard. The wooden body mimics a classic church, thanks to its bright white color and steeply pitched roof. Cypress shakes cover the roof for extra dimension, and a steeple here furthers the theme. Copper flashing on the roof ridge, along with a copper cap on the steeple, bring an elegant hint to this item. A faux wooden door and two imitation windows each sport pointed arches, for a Gothic effect, and a 1.25" diameter entry hole sits on the front of the home. This allows birds to access the item, while the roof keeps them protected from the elements. Gaps beneath the roof overhang keep the home ventilated, and a drainage hole on the base helps the nest remain dry. A copper cleanout panel on the back of the shelter may be removed for seasonal maintenance, and the square base allows the home to be pole or post mounted using a mounting plate (not included). Its wooden body will remain durable for many seasons, for a lasting impression in your garden. Add heavenly design to your bird sanctuary with this White Country Wildwood Church. Made in the USA.